We left at 10 am sharp. My mate Eric, from Cipta Sari Bakery Jalan Hasanuddin No. 47 Sumbawa Besar, on his Honda Beat scooter and me on a Kawasaki KLX150 Roadtrail. Before setting off I fueled up on Cipta Sari's most excellent lumpia washed down with a strong black. If there's a bakery that serves better cakes and snacks in NTB/NTT then I'm yet to find it. And Eric's workforce of charming, ebullient young women make any breakfast there a memorable experience. We bid adieu and headed out of town - destination Aik Renung, the Valley of the Forgotten Chiefs. The scene at the Pertamina servo on the outskirts of town was the usual busy one, with a dozen bikes queued up at the pumps. With full tanks and full bellies we hit the highway and threw a right at the T-intersection. This road would take us south towards Semamung. We'd have to turn left somewhere before Semamung but neither of us knew where and, in the absence of signs, we were toatally reliant on our GPS's - the tongues in our heads. We passed a likely looking road branching left and continued on for a while. I signalled Eric to pull alongside and we decided it was time to employ the GPS. We rocked up to a couple of women on bikes and, sure enough, the likely looking road we'd passed was the one we needed. Backtracking saw us heading south-west. After about 5km the blacktop ended and we hit a potholed mess. A few kilometres of this took us to a small village. More GPS work. We'd missed the turn. Another U turn, back track a couple of kilometers and there it was - a goat track leading into the scrub. We forged on heading uphill, lots of rocky rises with loose stones eager to bring us undone. But we prevailed, sometimes riding with legs out, ready to get the feet down 'just in case.' 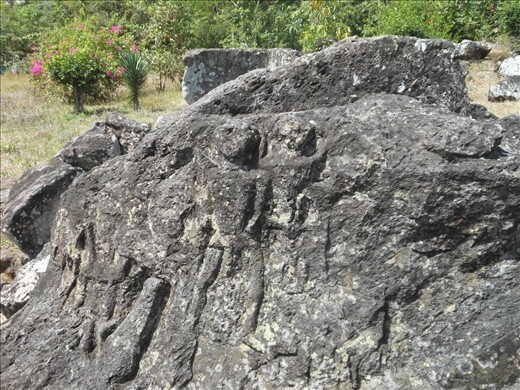 We asked a farmer about the 'kuburan batu' or stone tombs. He looked back at us stony faced, bemused by the question. We rode on and pulled up by a rude shack. A dog barked. We called out. There was no answer. The track got steeper. We were riding between low hills. The undergrowth was thick and at times brushed up against us as we picked our way along the track. Eric spotted a more substantial house in a clearing. We called out and from afar a voice answered. An old man appeared and confirmed we were on the right track. Another three sawahs, each one separated by scruby, low forest, and we'd come to some coconut trees. From there it was only a little bit further. We'd see a bamboo gate and a large house a couple of hundred metres away set beneath a huge mango tree. THe man living there could take us to the tombs. The old man knew what he was talking about. At the bamboo gate we called out and a voice answered. A man appeared and beckoned us enter. Pak Slamet was employed to plant oranges - a new venture. He lived a spartan existence in this beautiful valley. 'Yes." he said, "I'm lonely here. I suppose I could go and talk to the Chiefs though. Do you want to see them now?" We set off into the forest making our way upwards. The path was littered with dry leaves which crackled underfoot. It was dark and cool under the canopy. Then we emerged into the open. Before us stood a metal gate and beyond lay the tombs. In we went. They weren't huge, there weren't magnificent, but they were ancient. Who were these people, I wondered. What were their lives like all those thousands of years ago? What did they believe in? What did they achieve in life to be remembered so? The tombs were tiny. Hollowed out of solid rock, a corpse would have had to be shoe-horned in to fit. Perhaps the bodies were cremated first, then entombed. The tops were carved with a simple geometric motif. The rocks themseves bore impressive carvings of human and animal figures, the most impressive being the crocodile. But there were no crocodiles in Sumbawa now and anyway these people lived far from the sea. And how did they carve the stone? They must have had metal tools but with whom did they trade? So many questions - so few answers. Before long the caretaker of the site turned up. He'd been out in his fields. He invited us to sign the visitors book. Eric and I were the 10th and 11th visitors for the year - the date was July 17, 2013. Only one other non-Indonesian, an Aussie, had visited. We went back to Pak Slamet's house and tucked in to the lumpia and cakes Eric had packed. Sitting under the giant mango tree in that peaceful valley I could not escape my thoughts. I was a world away, in time and place, from the everyday world I usually inhabited. The spirit of the Forgotten Chiefs lived on. Their names may have faded from history but their presence was still there, palpable and immortal, watching over the valley and imprinting itself on the conscienceness of the few souls who passed by to pay their respects.